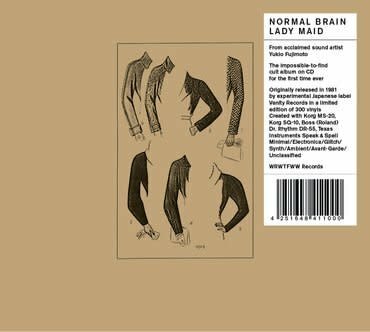 Reissue of the impossible-to-find cult album Lady Maid by Japanese outfit Normal Brain with liner notes by acclaimed sound artist and mastermind behind the project, Yukio Fujimoto. Originally released in 1981 as a limited vinyl pressing of 300 copies on Agi Yuzuru’s fabled experimental label Vanity Records (R.N.A. Organism, Dada, Sympathy Nervous, Tolerance...), Lady Maid is a testament to the creativity of the early 80s’ Japanese electronic and experimental scene, encapsulating a prolific era when audio gear became affordable for musicians to explore sounds in the comfort of their home, free from studio time pressure and major label rules. Entirely imagined and brought to life by an inspired Yukio Fujimoto, the 6-track opus was conceived with a Korg MS-20, a Korg SQ-10, a Boss Dr. Rhythm DR-55, and...a Texas Instruments Speak & Spell! It’selegantly minimalist, honest and witty, very playful, cleverly pop, and downright fascinating. The a-side captures the fun side of avant-garde electronica, lo-fi wave, proto-glitch, and IDM, a joyful ride beautifully interrupted by the cinematic mood switch of the b-side - a 20 minute ambient piece flirting with sci-fi, melancholy, and hints of metallic darkness. Unclassifiable and marvelous! For fans of electronic, experimental, minimalism, lo-fi, ambient, avant-garde, synth, proto-glitch, post-rave, sci-fi, Kraftwerk, Cluster, David Cunningham, Brian Eno, EP-4, R.N.A. Organism, Vanity Records, Warp Records, honest homemade music, sound installations, cool weirdoes and cassette tapes.